Both metal and asphalt roofing get the job done when it comes to sheltering a building, but they really part ways when it comes to durability, energy efficiency, and cost. If you didn’t noticed, it was pretty hot this summer. And if you have ever been in an attic or crawl space in the middle of a summer day, you know what it feels like to be in an oven. The sun is beating down with all its force onto your asphalt shingle roof. Some of the heat is reflected, but the rest is absorbed through the roof into the air space and building below. The nature of the materials used with even the lightest color asphalt shingles results in only about 22% of the sun’s heat being reflected. That means 78% of the heat is being absorbed into the building below and your air conditioning system has to work extra hard to cool off the building and keep you comfortable. You can see how hard your system is working by looking at your energy bill. Nobody likes to see their electric bill spike in the summer. Ever think about how choosing a metal roof can save you money? The most popular metal panel from A.B. 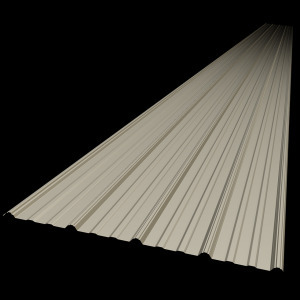 Martin Roofing Supply is by far the heavy-duty and long-lasting ABM Panel. This specially coated panel reflects as much as 83% of the sun’s energy away from the roof, resulting in a cooler building, more energy savings, and greater comfort. The reflectivity level varies across all our cool roof colors, varying from Dark Blue (13% reflective) to Bright White (83% reflective), but averaging at 44% reflective… which is twice as reflective as asphalt shingles. Metal roofs can be about 100 degrees cooler on the surface than traditional asphalt roofs. Plus, the ABM Panel comes with a 40-year warranty, so you can enjoy your energy savings for a long time to come. Check out the Solar Reflectivity Index if you want to know where each of our colors measure up.